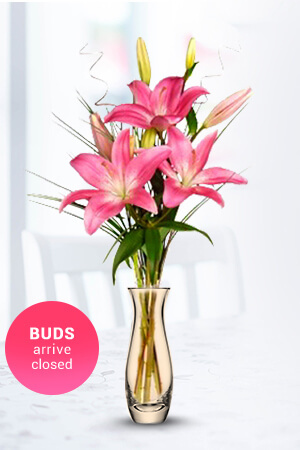 This elegant bouquet is made using beautiful Asiatic Lilies, greenery and a simple wrap. Simple yet breathtaking.Lilies may be sent closed/partially closed in order to prevent damage and to last longer.Vase not included but should you wish to add to the pleasure of sending flowers, not to mention receiving them, we recommend sending a Standard Vase along with your flower bouquet. I was very impressed that my order was delivered by 12pm when I requested. Great reminder email. Simple to shop and payment was easy. easy online purchasing. then when I realised I wanted to add another line to my message this was received and actioned. - wonderful stuff thank you. Easy to get around site. Zflowers always supplies beautiful flowers and always on time.